No, it was even more than that. It was as if time was suspended and this contributed to the beauty of the island. 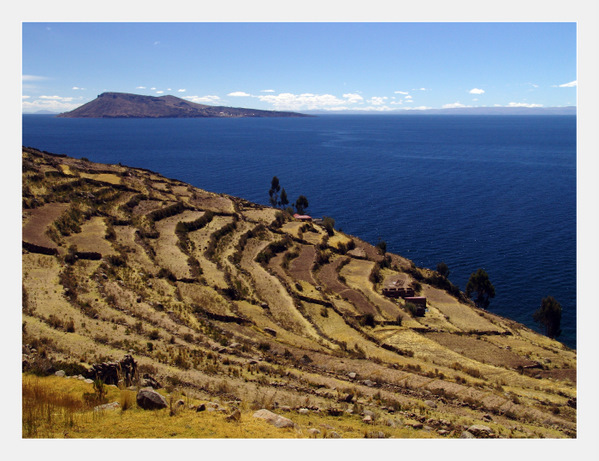 The walk leading to the town is beautiful and my eyes wandered along the deep blue of Titicaca Lake, the awesome island scenery, the children in their colored costumes strolling with their sheep and the colorful laundry leaned on the houses roofs or the grass. Everywhere, men knitting hats with beautiful and complicated patterns and lots of colors, a way to distinguish single from married men. Taquileños are well-known for their fine hand-woven textiles, among the most awesome handicrafts in Peru. There a lots of wonderful textiles to buy and it’s additionally a good way to support the community. As it happens in many other places in Peru, Taquileños wear their traditional costumes. A mix of peasant clothing, adopted from the Spanish, and Andean-style garments: colorful ponchos, belts, mantles and other accessories. I still remember the magic of this little island and have one regret. I should have stayed longer, a couple of nights, sleeping in the local guest houses to discover more of this incredible people, some of which maybe never left the island. Lovely pics and great memories. We also spent one night on Taquile and wished we could have stayed longer. As you describe so well, it really is one of those places where time doesn’t seem to have moved – for centuries! Thank you, Andy. It’s really interesting to read that we both gathered a similar feeling in Taquile of time somehow frozen. Definitely, Taquile is a place worth a longer stay! TOTALLY amazing..! by the way, why is it that they distinguish married from single men by the knitting hats with beautiful and complicated patterns and lots of colors? u mean the single men knit or.. ? photos are spectacular – u did the place justice simon.. lovely! Stunning photos!!! 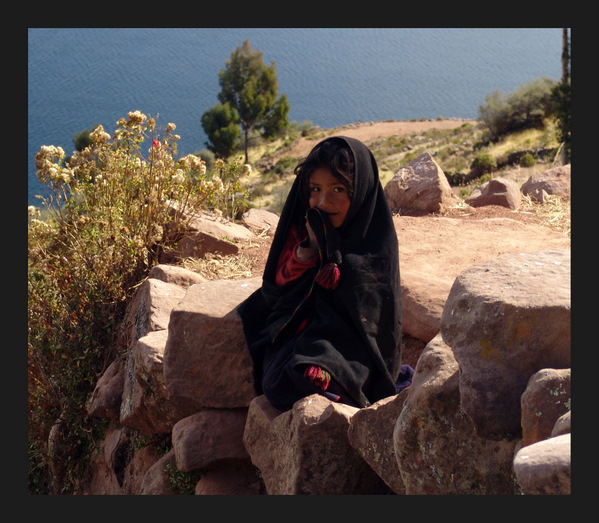 I was at Lake Titicaca a year ago. I LOVED it, but was too sick to really enjoy it. I will definitely 1 day return and hopefully I won’t be so sick then. What a pity being sick in such a lively place! But that’s something that happens quite often because of the altitude. I was lucky enough to feel always very well so I could fully enjoy every single day of this wonderful country. Looks like a fantastic place to visit. The picture of the girl is lovely. Will put a link to your site on my main blog. Thanks for stopping by and you comment, Robert. Taquile is really a wonderful and uncommon place to visit. As for the girl… I fell in love with the eyes of Perivuan kids. So expressive and deep! It’s very kind from you to link my blog to yours. I’ll be glad to reciprocate. Wow – I wish I was on that island with you. I love the first photo. She’s so innocent and curious.